I’m so into stranded color work these days. No matter what, I’ve got to have at least one stranded project on the needles. 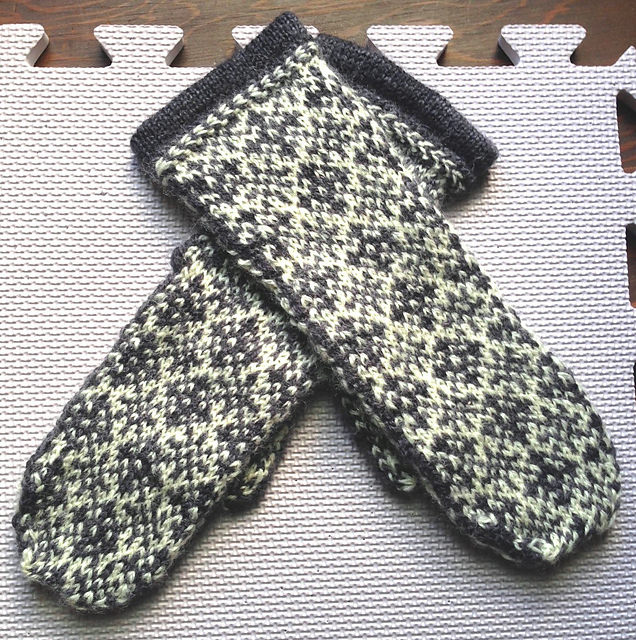 A couple of weeks ago, I picked up a simple stranded mitten pattern on Ravelry called January Mittens. I decided this project would provide a good opportunity for me to experiment with a fibery phenomenon called yarn dominance. A few notes about yarn dominance: When you knit stranded color work (let’s assume we’re talking about just two colors), one yarn is always coming from above and one is always coming from below. The yarn coming from above has to travel just a little farther than the yarn coming from below and, as result, that “above” strand is just a little bit tighter. This tightness makes that stitch smaller and the yarn recedes into the background. The lightly looser strand coming from the bottom does not recede; its larger stitches stand out, loud and proud in the foreground. Playing around with yarn dominance can make a big visual impact in your stranded color work. 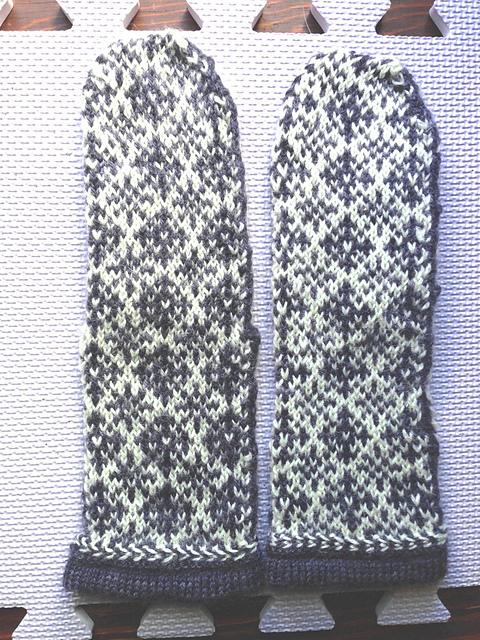 I knitted one mitten with the dark gray yarn held dominant, and one mitten with white yarn held dominant. Can you tell which is which? It’s subtle but it’s definitely there. In stranded color work, if one yarn is playing the dominant role, what role does the other one play? Submissive? That makes my knitting seem so much more outre and exciting. I’m having trouble deciding which mitten I like better. I might actually like the one with white yarn held dominant. Some of the details in the pattern jump out more when they’re not drawn so strongly. Veeeerrry interesting. I think I prefer the one with white as the dominant color, because it makes the pattern look more crisp. I really actually like the subtle contrast of using different dominant colors!! Where appropriate, I may do this in the future to help me differentiate between right and left mittens. Also, because I’m a knitting nerd and I think this phenomenon is really cool. I like the one on the right a little bit better BUT they are both beautiful! I enjoy that I’ll have to slightly different mittens to wear. Or someone will. I haven’t decided if these are a gift. I feel like I need to give them to someone who will properly appreciate the whole yarn dominance thing. I never knew this before – thanks for sharing. I definitely like the one with the white dominant, it looks cleaner, sharper, somehow. So far only one person has told me they liked black dominant better. Neither choice is “bad,” just different. I guess that’s why the universe gives us options. I’m partial to the white too. That really surprised me. I knitted black dominant first and when I knitted the white dominant mitten I honestly thought I was doing it just for the purposes of the experiment. I didn’t think I would actually like it better. I give up… I can’t tell, but I love them both! I like the one on the right in the bottom pic. Can’t tell which is which in terms of dominance (!) but I like the way the pattern looks. I had never thought of that before (the only color-work I’ve done so far is christmas stockings! ), but it’s really interesting how it shows up differently! Almost likely a negative image. Very cool. I think they’re both great looking! I love both. They are so beautiful. Great job! That’s fascinating. As you said the difference is subtle but I can really see it, especially in the first photo. I like both. It’s not a difference I would notice if I weren’t looking for it. I imagine most people who see you wearing them will see 2 identical mittens. I’m going to go with the crowd and say I have a slight preference for the white-dominant myself. I’m with you. I’ve definitely seen examples where the difference is much more pronounced. I think in the future of I do searched for a colorwork sweater I’m going to make sure to include different sections with different yarn dominance. You never know if you might find a serendipitous switch of dominance. Maybe experience will help. I like the white dominance too. It’s brighter and more alluring to the eye. I like the white dominant, too — that’s the one on the right, right? I made a pair of Striped Mittens from Robin Hansen’s mitten book, and the color dominance thing happens in those, too. I made color 1 dominant on the cuff and color 2 dominant on the body. Subtle, but evident. What a great experiment! I find I love the yarn dominance theory when I’ve got one or two stitches in a field of color that I want to make pop. I love that those little bitty accent stitches aren’t getting lost any more! Thanks for doing the experiment. I would not want to bother. Yet seeing you, just a really good knitter that shares good stuff, encourages me to go the whole mile with the knitting. Lovely and you enjoy wearing both mittens. I like both and I doubt I would look very closely at someone’s mittens to pick up the subtle difference. But it is important and nice to try out on a small project. I don’t think I would have had the nerve to try it on a project that that would have been unusable if I did it the wrong way.